So What Is Lace Anyway? What do you think of when you hear the term “Lace”? If you are anything like me you will probably think of something white, intricate and delicate, possibly even frilly. We usually associate lace with things like wedding dresses, christening gowns and ball dresses. Lace fabric and trims are often used for special occasions like these. A fairly generic definition of lace is “a fine open fabric of cotton or silk, made by looping, twisting, or knitting thread in patterns and used especially for trimming garments.” As you can see, this includes a lot more than the traditional idea of lace. I would like to share with you some personal examples I have at home. The more traditional items I have are crocheted and tatted. These items were all made by my grandmother, and I inherited them from her. The small round table cloth is crocheted. It was made using a small hook and fine cotton. The tatted items are a bit older. These items used to be more common when lace was a lot more expensive and less readily available than it is today. People made collars, cuffs, and neck trims which could be transferred from one garment to another. This set is two collar points and a central trim a bit like a cravat. I have also included a rather basic example of bobbin lace. This is one of the test book marks I made when I started to learn to make bobbin lace. It was made using coloured crochet cotton. You may also remember the needle lace sampler that I started earlier in the year. Unfortunately I have not made much more progress on it as yet, but hope to do some more in our upcoming school holidays. The last photos are of a shawl I knitted for one of my grandchildren. This is a bit heavier than the other examples, but the border of this shawl still qualifies as lace. I have made a lighter, lacier baby shawl but, unfortunately, I don’t have any photos of it. 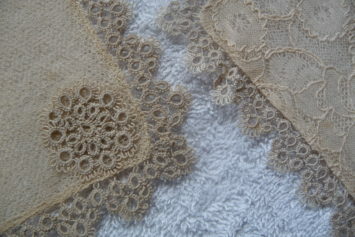 I plan to follow up with some more examples of different types of lace soon.